"Because" is a subordinating conjunction, allowing people to link their ideas together and to understand and to express why things happen. It is a word used frequently in stories, procedures, recounts, science experiments and other non-fiction reading tasks, and persuasive speaking and writing tasks. "Because" helps people to explain their thoughts and feelings, to justify their opinions, and to verbally reason with others. "Because" is thus an important target to develop language content, structures and social use. Some people - including some people who are learning English as a second language and people with language disorders - have difficulties understanding and/or using "because" as a subordinating conjunction. We designed this no preparation pack to help model the form in a focused way. 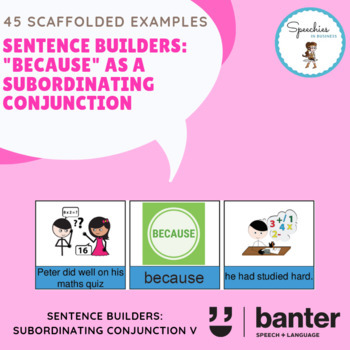 Featuring pictures and words, this resource is designed to help people of different ages and abilities to understand "because" sentences.